Kathryn Hujda is an archivist and keeper of cultural memory working in the Twin Cities. Her poems have appeared in Stone Path Review, Modern Poetry Quarterly Review, and Sidereal Journal. 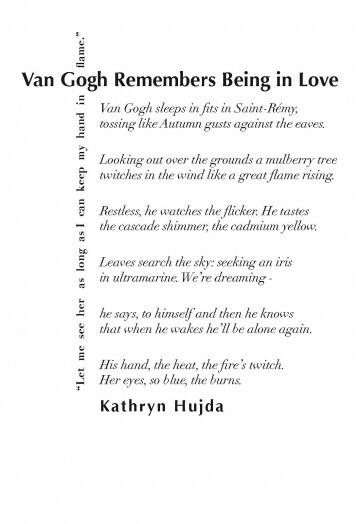 Kathryn Hujda infuses her poem with the same contradiction that draws us to Van Gogh’s paintings. For both the artist and the poet, “a mulberry tree/ twitch[ing] in the wind like a great flame” isn’t metaphorical; the same life force that animates the tree, that helps it grow, also consumes it. Cadmium yellow burns brightest against the strong contrast of ultramarine. Life is a long exercise in death; love is exquisitely painful. Perhaps, in his illness, Van Gogh felt this more acutely than most, but the poet is right to invoke his art, to remind her reader that life’s extremes cannot be separated. Flames, shimmers, cadmium yellow… The typefaces and the layout need to reinforce what is both robust and fragile about love’s fire. Didot’s lower case v and w seem to flicker on the page, as does the ligature connecting the flourish of the lower case f to an adjacent l. The arrangement of the title, epigraph, and poet’s name, all in the more subdued Optima, create the borders of a canvas; at the same time, the vertical epigraph is interrupted by the title just enough to suggest the gap between a candle and its flame.